Relationships take work. In this much-anticipated book, best-selling author Matthew McKay and psychologist Avigail Lev present the ten most common relationship schemas, and provide an evidence-based acceptance and commitment therapy (ACT) treatment protocol for professionals to help clients overcome the barriers that hold them back in their relationships.Romantic relationships are a huge challenge for many of us, as evidenced by our high divorce rates. But what is it that causes so much pain and discord in many relationships? 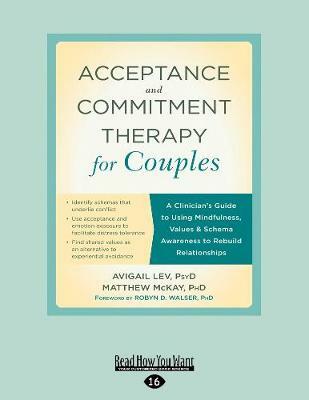 In Acceptance and Commitment Therapy for Couples, Matthew McKay and Avigail Lev provide the first ACT-based treatment protocol for couples that identifies the ten most common relationship schemas and the coping behaviors they drive to help you guide clients through their pain and toward solutions that reflect the needs and values of the couple.Rather than working to stop relationship schemas from being triggered or to reduce schema pain, you ll be able to help your clients observe and name what triggers their rigid coping behaviors when their schemas are activated. And by learning new skills when they re triggered, your clients will be able to replace avoidant and coping behaviors with values-based action for the betterment of the relationship.By making your clients avoidant behavior the target of treatment as opposed to their thoughts and beliefs this skills-based guide provides the tools you need to help your clients change how they respond to their partner. 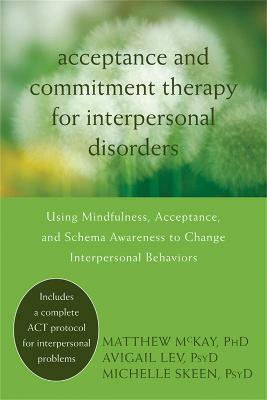 Buy Acceptance and Commitment Therapy for Couples by Avigail Lev from Australia's Online Independent Bookstore, Boomerang Books. Avigail Lev (Author) Avigail Lev, PsyD, maintains a private practice in Berkeley, CA. She specializes in couples' therapy and also treats individuals who struggle with interpersonal problems, anxiety, trauma, chronic pain, and mood disorders. She has provided supervision, trainings, and workshops utilizing cognitive behavioral therapy (CBT) and is the coauthor ofAcceptance and Commitment Therapy for Interpersonal Problems. Matthew McKay (Author) Matthew McKay, PhD, is a professor at the Wright Institute in Berkeley, CA. He has authored and coauthored numerous books, including The Relaxation and Stress Reduction Workbook, Self-Esteem, Thoughts and Feelings, When Anger Hurts, and ACT on Life Not on Anger. He has also penned two fiction novels, Us and The Wawona Hotel. McKay received his PhD in clinical psychology from the California School of Professional Psychology, and specializes in the cognitive behavioral treatment of anxiety and depression. He lives and works in the Bay Area.